Weber Shandwick's whisky-tasting event and Falkirk Council among Scottish winners. Falkirk Council ran a six-week campaign to raise awareness of dog fouling and how to reduce it. The campaign used billboard and bus shelter advertising, and the council's website, and was promoted at community events. A launch stunt was held inviting schoolchildren to count the number of dog poos found on a stretch of grass. The children were interviewed by GMTV and the campaign was covered in the local press and on the BBC website. As a result of the campaign, there was a 53 per cent decrease in dog fouling. Weber Shandwick set up a whisky-tasting event through Twitter, organising three simultaneous tastings in London, Edinburgh and Leith. Key bloggers and journalists were invited to form an expert panel. Society members were invited to order the whiskies chosen for the tasting so they could join in. At each tasting, live Twitter feeds were projected on to a large screen for the panel to interact with those who joined the online tasting. In 2009, Napier University rebranded as Edinburgh Napier University. The corporate affairs team led the rebrand, including a refreshed coat of arms, a new university tartan and new gowns for graduation, plus media relations, internal and stakeholder comms and events. More than 500 pieces of coverage were generated and undergraduate applications rose by nearly 50 per cent compared with the previous year. Mackintosh 100 is an events programme based on architect, designer and artist Charles Rennie Mackintosh. The PR team created a logo for the brand and generated coverage in local, national and international media. Matthews Marketing also upgraded the website, put together an events programme, negotiated sponsorship and used targeted advertising. 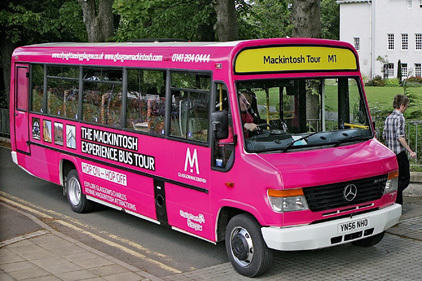 Visitor numbers to Mackintosh attractions increased by eight per cent.